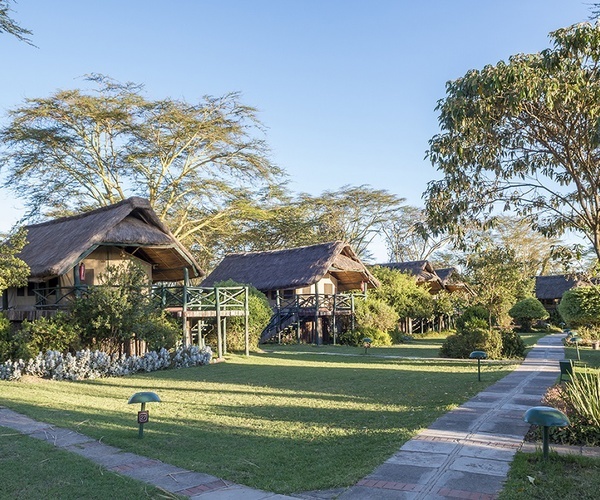 Sweetwaters Serena Camp lies in the heart of 24,000-acre Game Reserve, with magnificent views across the plains to the snow capped peaks of Mount Kenya. It’s location in a private conservancy with a higher wildlife-to-area ratio than any of Kenya's national parks makes Sweetwaters Serena Camp one of the most exclusive tented safari camps in Kenya. Built in the early 1970s, the main building was originally the residence of billionaire Adnan Khashoggi’s ranch manager. An addition in 1988, the luxuriously appointed en-suite tents overlook the waterhole, a haven for thirsty wildlife. Sweetwaters is the name adopted by the local people of this area for the fresh, sweet, water tapped from the ground. Floodlit by night, the waterhole provides excellent and secluded game viewing, rarely seen elsewhere. Located in typical savannah grasslands interrupted by the whistling thorn shrubs and Acacia trees, the camp is truly an oasis. It offers guests the indulgence of a swimming pool, some of the finest tented accommodation in Kenya and a personalized service and attention. At the camp, there is plenty to do. Guests set out on game drives where their companions are Giraffe, Zebra, Eland, Oryx, Waterbuck, Grant’s gazelle, Thomson’s Gazelle, Elephant, Buffalo, Cheetah, Lion, Silver-backed jackals, Ostrich, Hartebeest, Baboon and Rhino. There are also several hundred-bird species to be observed. Game drives are indeed a pleasure! Here the flora and fauna are found in their totally natural state. Unlike some Kenyan National Parks, the terrain here is not eroded by scores of vehicles; hence the game grazes blissfully, indifferent to the stares of their inquisitive visitors. Game viewing also takes the form of game walks accompanied by a Resident Naturalist, and game rides on horseback. There also is camel riding, and night game drives are a definite must for guests, as are "bush" lunches or dinners. A new addition to the camp family is the Chimpanzee Sanctuary, and this site is also dedicated to the black rhino breeding area, which all guests are thrilled to visit. A boat ride through this haven is a pleasure indeed. 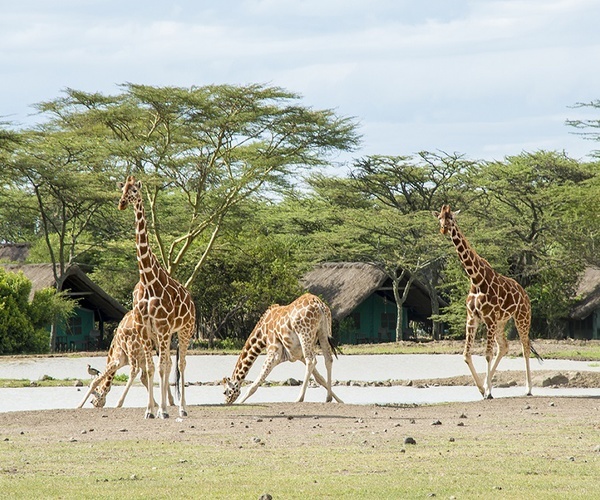 This game sanctuary is the closest reserve to Nairobi (2.5 hrs drive) home to all the big five game, and has the highest ratio of game-to-area of any park or reserve in Kenya. 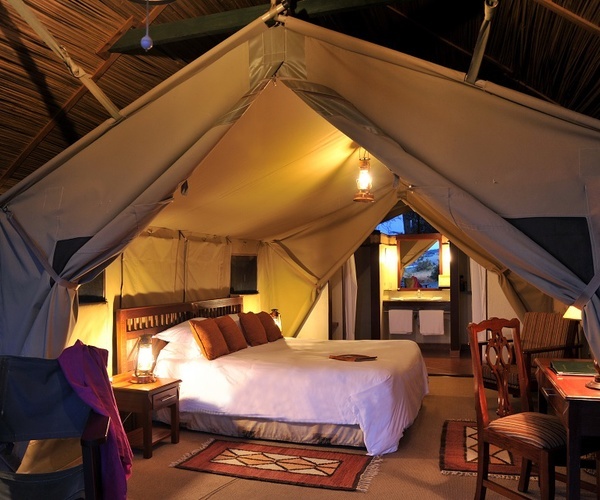 Luxury tents, excellent game viewing, and superb cuisine places this Camp in a class of its own. Would you like to stay at Sweetwaters Serena Camp for a visit & safari? Have a look here for the best prices & offers available!